Next Bleached Denim Tie Front Top - Size 12 -. Condition is U sed but Immaculate as only worn once. MISS N by NEXT Stunning Size 28 Black & Cream Lace Top Blouse With Vest Top. Condition is Used. Dispatched with Royal Mail 2nd Class. 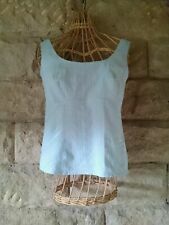 BNWT Next Beaded Jersey Vest/ Sleeveless Tunic Top. Size 14. Pretty vest/ sleeveless tunic top from Next. Beaded detail to the front. 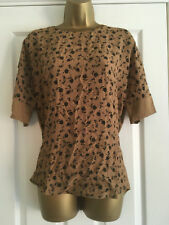 Next brown multi pattern scoop neck short sleeve top size 14. Has a button on each shoulder and a spare button inside. good condition. Condition is Used. Dispatched with Royal Mail 2nd Class. New listingBlack Jumper With Silver Hearts Next Size 12. Immaculate black 3/4 sleeved light weight jumper from Next Size is 12 and is in excellent condition. The back is plain black. The front has metallic hearts. The jumper has a scoop neck. There is very little stretch. Measurements for chest are 34” with an overall length of 25.5” From a pet and smoke free home. Bow detail to the chest. Ladies t-shirt by Next. Short cap sleeved. WOMANS ORANGE NEXT VEST TOP, SIZE 12. LOVELY STUNNING TOP WITH WRAP EFFECT DETAIL. BEAUTIFUL NEXT BURGUNDY WRAP STYLE TOP. WRAP STYLE. MACHINE WASHABLE WASH INSIDE OUT. UNDERARM TO UNDERARM 22" SO WILL FIT UP TO 44" BUST. SIZE 18 - EUR 46. 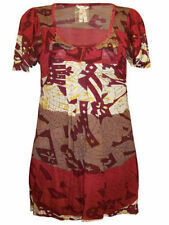 Ladies Blue/Multi Tunic/Vest Top by Next Runway Collection. Pretty butterfly print fabric which has a little stretch in it, machine washable. Ladies long top as shown in the photo. the length is 35". NEXT YELLOW FLORAL TOP FOR SALE IN VERY GOOD CONDITION,SIZE 14. IT HAS A BUTTON TO THE FRONT NECKLINE WHICH CAN BE UNDONE AND AN ELASTICATED WAISTLINE. Pretty top made from 100% cotton. Great condition. Pit to pit 21" Length 26". BLUE MULTI COLOURS. LENGTH MID BACK NECK TO HEM IS APPROX 26". LADIES NEXT TOP. UNDERARM TO UNDERARM IS APPROX 21". 100% VISCOSE. NEXT LADIES TOP SEQUIN DETAIL SMALL POCKET ON FRONT, SCARFE ,TOP AS BEEN WASHED MAKE UP ON IT WHEN TRYING IT ON NEVER BEEN WORN. Red long hip length top from Next to fit size 10 with long sleeves and a scoop neck. Top has been worn and has a bit of wash fading around the seams but overall is in good condition. 100% cotton. Machine washable. Ladies Next sheer white top size 8 (8-10). Sleeveless with tie front and stud detail Condition is Used. Dispatched with Royal Mail 2nd Class. It is a slip on top with no fastenings. Ladies NEXT Embellished Summer Top. Size 16. Pre owned. 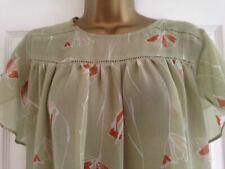 Ladies Next Multi Colour Floaty Floral Top Size 20. NEXT Black and Cream Floral Semi Sheer Gypsy Top Size 14. Condition is Used. Dispatched with Royal Mail 2nd class signed for to protect you and me. Next ,Floaty , Ivory Top Size 16. Lovely top only worn a couple of times. Please check out my other items as selling lots of clothes due to weight loss. NEXT Womans Strappy Summer Top. Size 12. Pink,green, Blue, Cream Pattern. NEXT Womans Strappy Summer Top. Size 12. Leaf pattern in cream, pink, blue and green pattern. Top fastens with 7 cream fabric buttons at the front with a frill. Tie belt attached. Top has a frill at the bottom. A pretty top that will look great for summer holidays. BELT TO BACK, DO LOOK AT PICTURES AS ITS OPEN BACK. SIZE 20 AND 26" LENGTH WILL FIT A 40-46" BUST. LOVELY NEXT OPEN BACK TOP. THIS IS A REALLY LOVELY TOP BUT I HAVE LOST WEIGHT BEFORE I GOT THE CHANCE TO WEAR IT. Womens quality feminine floralparty/occasion blouse Front material viscose Back poluester Size 16 By next VGC Please ask any questions Always combine postage, as in as many items in one parcel sto save on postage Pay pal please within 24 hours of winning bid Any problems, don't leave negative feedback,I always wash and make sure items are in good condition, but sometimes an item slips thru the net so please email me first, if their is a problem with the item not mentioned you will obviously get a full refund and return postage paid, no questions asked....i am a very fair and friendly ebayer!! My feedback is extremely important to me......thankyou for looking at my items. Ladies NEXT Top. Lovely condition. 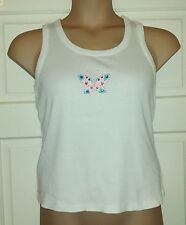 NEXT Ladies top size 12/14 Blue, White, Cotton, Lace, Swing, Summer, Sleeves,vgc. Condition is Used. Excellent condition as worn twice. Pretty swing style cotton top . Loose fit so a loose size 12 and would fit size 14 too. Measurements: Length 25 inches Sleeve length 24 inches Chest 44 inches Hem 56 inches Scoop neckline and long sleeves with button cuffs. Flattering and easy to wear. Blue and creamy white floral printed good quality cotton. Details such as pin tucked front, lace trim on sleeves and lower body add to the style. Hangs well. Looks good with skinny jeans or cream Capri style trousers. A great top for Summer. Lovely satin feel top with decorative tie fastening at bottom. Two miniscule pulls on back, otherwise in good condition. Small beaded circles to front of top. Plain back to top.